Created by Fumi Yoshinaga, Ōoku: The Inner Chambers imagines a world in which a strange new disease, called the Redface Pox, kills young men and boys. The male population begins to fall in the 1600s to about one-fourth of the female population. Men eventually become protected as precious “seed bearers,” and women take on the roles traditionally held by men, including the role of Shogun. This story focuses on life at Edo Castle and is set inside its Inner Chambers, a sort of harem filled with men who serve the female Shogun. Ōoku: The Inner Chambers, Vol. 6 focuses on the fifth and sixth Shogun – Tsunayoshi and her heir Ienobu. The lives, loves, and desires of Ienobu’s concubine, Katsuta Sakyo, and Ienobu’s personal female attendant, Manabe Akifusa, are also examined. THE LOWDOWN: Early in the series, Ōoku examined gender roles in a society where male dominance by necessity suddenly became a thing of the past. It was interesting to see how Ōoku creator Fumi Yoshinaga imagined what role reversal might look like in 17th and 18th century Japan. Much of the story since then has focused on character drama, with mostly good results. This volume finds Yoshinaga not only delving deep into the politics of the Inner Chambers, but also plumbing the depths of relationships, motivations, and conflicts. Additionally, Chapters 23 to 26 give the most intimate view of what is going on inside the characters’ heads, and it makes for good reading. 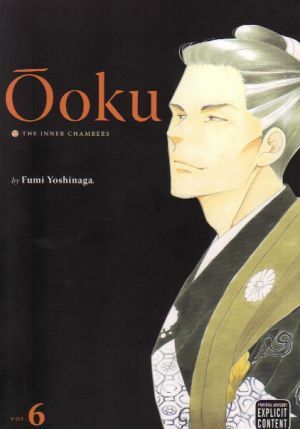 POSSIBLE AUDIENCE: Readers looking for excellent character and historical drama will find it in Ōoku: The Inner Chambers.